Applications: The ZMX8210 lets you take up to eight input signals and route them to any or all of three destinations. Maybe you want to play stereo music for clients waiting in the lobby of your office complex and page people in the work area. Another example might be the small church that wants to play soft music in the foyer, mic the preacher in the sanctuary, then send the sermon and music to the nursery. These are all perfect applications for the ZMX8210-multiple sound sources, multiple zones, total flexibility. Announcements That Get Heard: You can also set the ZMX8210 to automatically lower the volume level of the program music in specific zones during announcements. Referred to as "ducking," this feature allows the voice message to take precedence over the musical program, without turning the music off completely. This ensures that even the softest voice will be heard in the selected zone(s). As an added benefit, remote volume controls can be installed in areas where even more control is desired or needed. Superior Sound Quality: You can use any microphone with the ZMX8210, including professional-grade condenser mics, thanks to the onboard phantom power. The eight input channels feature high-quality mic preamplifiers for absolutely pristine sound quality. A master 4-band equalizer is provided to ensure voice intelligibility and address any potential feedback problems. 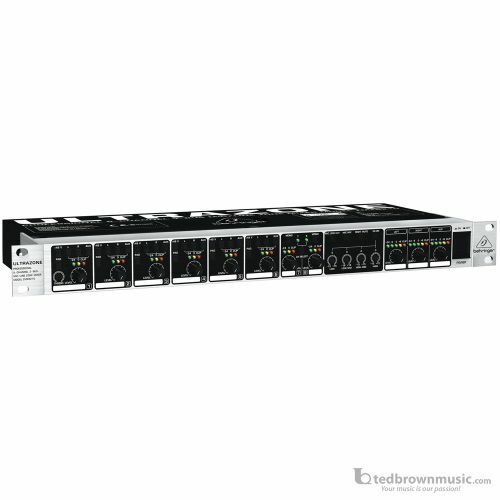 And if you need more than eight channels, two ZMX8210s can be linked together, providing a total of 16 inputs. Thanks to its intuitive control panel, even inexperienced users will find the ZMX8210 easy to operate and its professional features will give you total control over your sonic environment.